Before I tell you about this wonderful day of wine, you need to know that the Rhone Valley is my husband’s favorite wine region. The Cotes du Rhone section at Total Wine has been much loved in our house. So to be actually able to drive through and visit the wineries that produce his favorite wines, talk directly to the winemakers, and drink a vintage that hasn’t even been bottled? Exciting, to say the least. We traveled to the Provence region over Christmas 2016 with another couple from our church who also love wine. Doing some type of all-day tour or excursion was high on our list because they had traveled with us to Portugal and we had such a great time on our all-day tour in Nazare. We wanted to be able to have a fun and informative experience learning about this French wine region that we already know and love. After doing research on different tour guides, we decided to go with Mike Rijken of Wine Safari. 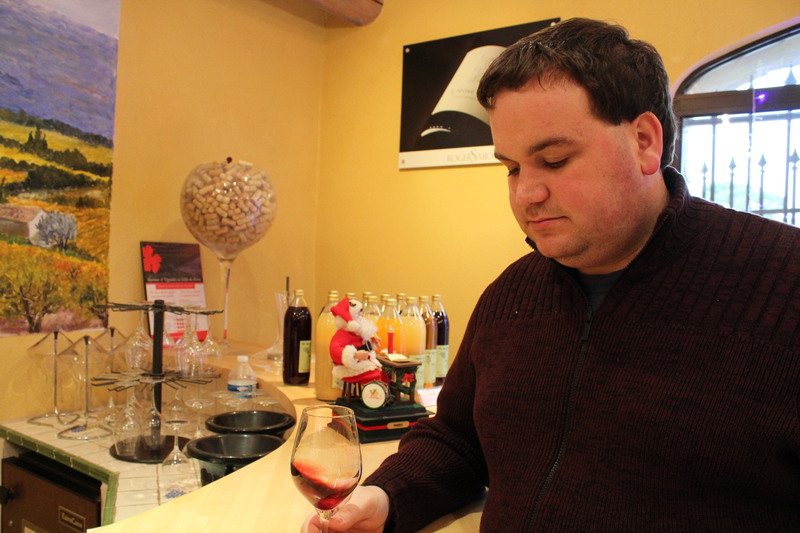 Mike has an impressive background and knowledge on the Rhone region and wine in general. He also has a deep love and understanding for food and how it pairs with wine, so he totally spoke our love language. 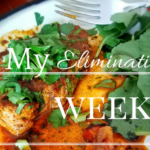 We liked his style from what we could gather from his website, and it also didn’t hurt that he was highly recommended in our Rick Steves book (aka the tome of all knowledge). 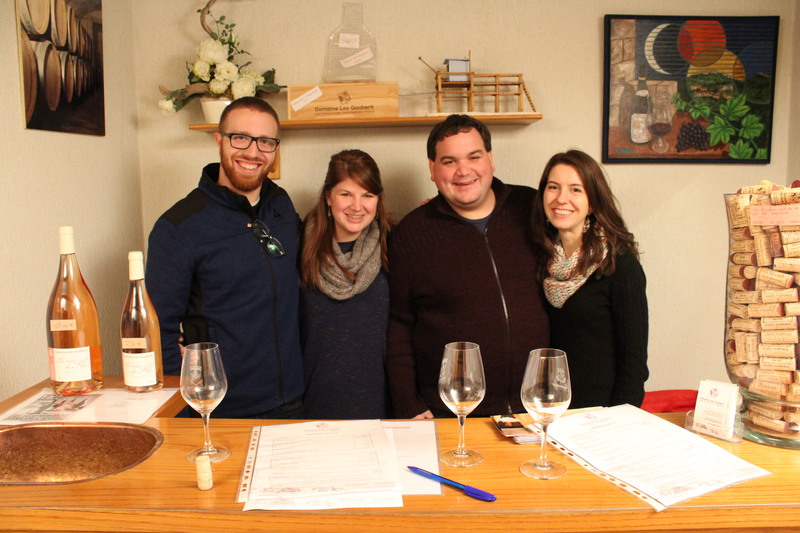 I’m sure we would have been happy with any of the tour guides we were choosing from, as they all have their own personal style and relationships with different wineries throughout the region, but we were very happy with our choice and had a great tour with Mike! 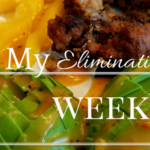 Mike picked us up promptly and we headed out of Avignon while I finished munching on my delicious crumbly quiche. (What’s a wine tour if you don’t have a French pastry to begin your day?) 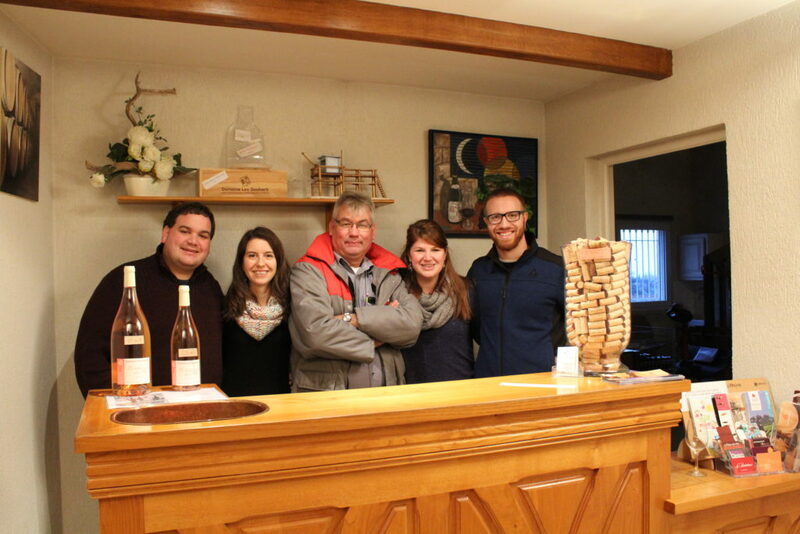 On the drive, we learned more about Mike’s family, his background, and what brought him to become a wine tour guide. 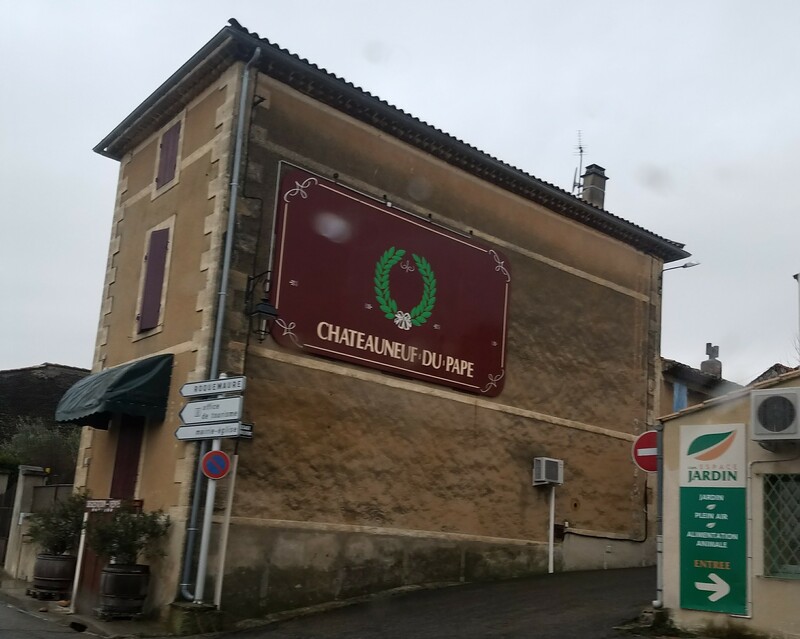 As we got closer to Chateauneuf, he talked to us about the history of the Rhone Valley wines which reach back to the first century, the agriculture, regulations, how it’s been produced throughout the centuries, and what production for Rhone Valley wines look like now. Before we hit the wineries, Mike wanted to give us more appreciation for the history of the region. 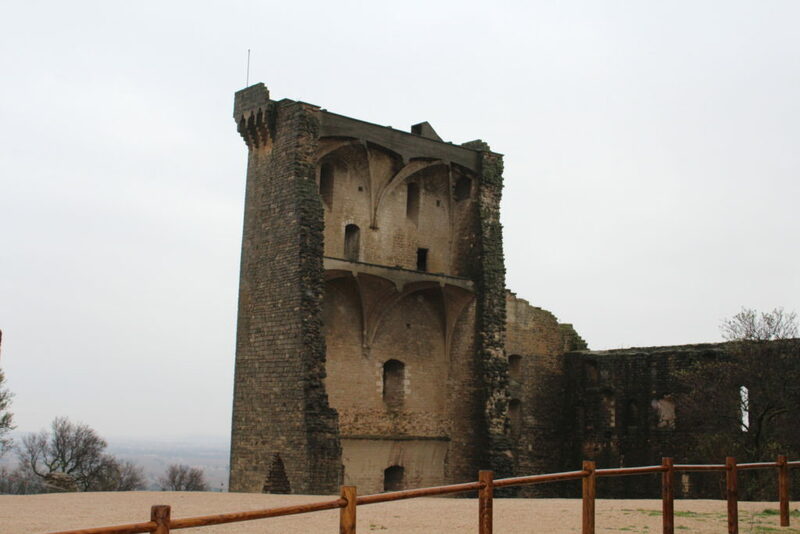 Our first stop was the Chateauneuf du Pape castle, which has a very interesting story. It was most likely originally a Roman castrum in the first century. 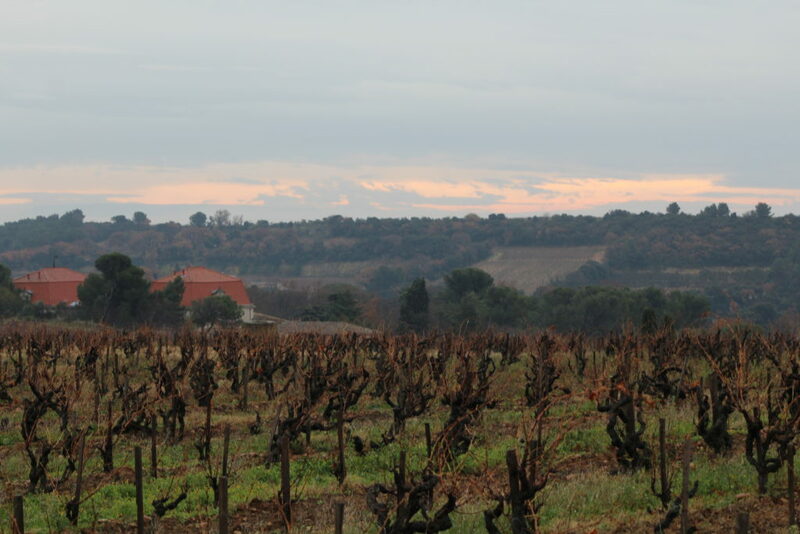 The first mention of it as a Chateauneuf was in 1048, and the first mention of a vineyard being present was in 1157. In 1893, the mayor of the town officially changed the name of the fortification to Chateauneuf du Pape. Sadly the last version of the castle was destroyed in 1944 after the Germans took it over in World War II and only the ruins remain. It was a rainy and windy day, so we didn’t stay at the castle for long. But the view was beautiful and allowed you to have an expansive view of the entire region. You can see why the Avignon Popes chose this spot in the 14th century! 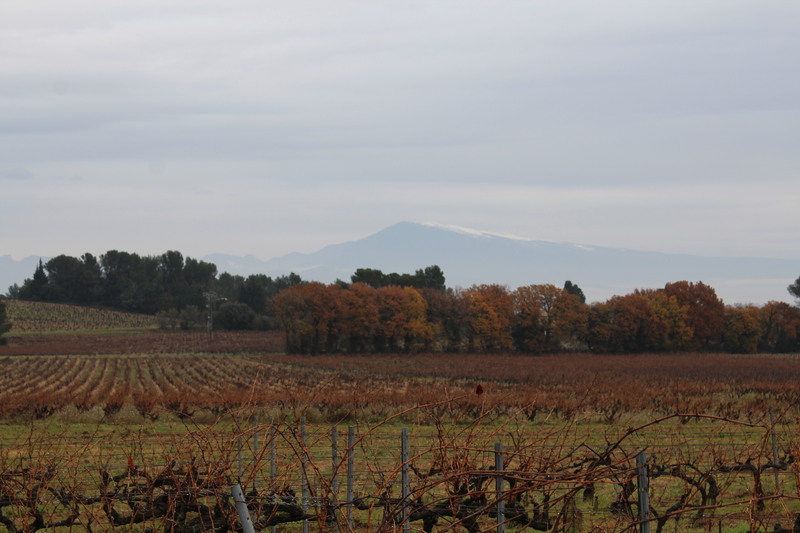 On a clear day you can see the outlines of the popes castle in Avignon and Mont Ventoux, and the foothills of the Alps. 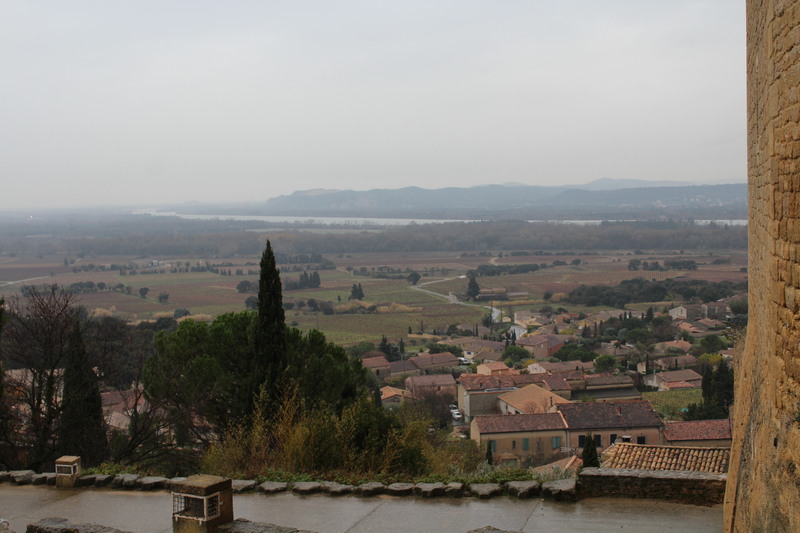 The Rhone Valley is an ideal place to grow wine because of the Mediterranean-type climate. We learned about the main grape varietals of the Rhone in a interactive manner. 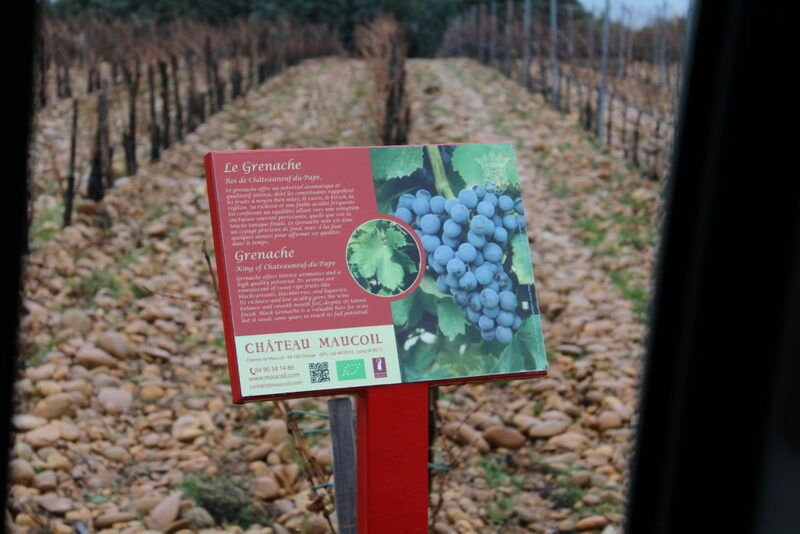 Mike drove us through a vineyard right next to the castle ruins, the Chateau Maucoil, which had handy plots for each grape and an informative sign. 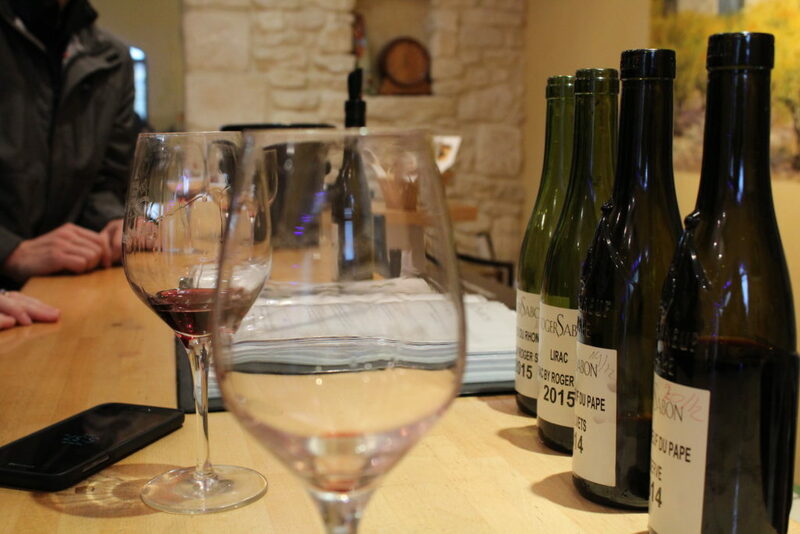 The Rhone Valley specializes in Rhone blends (Grenache, Syrah, and Mouvedre blends), Syrah, Marsanne-Roussanne, and Viognier, but that only skims the surface of the many grape varietals grown. I wish we had a voice recorder so we could remember all the details that Mike told us about the grape varietals. As we were driving, we finally got a good view of Mont Ventoux. Here you can see 3 of the 4 types of soil in the Rhone displayed: granite, sandy silica, limestone and clay. Driving through the landscape in the Chateauneuf du Pape was breathtaking, even in the clouds and rain. This is what is known as the “goblet” style, which works well in the Rhone’s warm climate, is one of the techniques for training a vine. The technique has to do with balancing the wine and fruit quality. 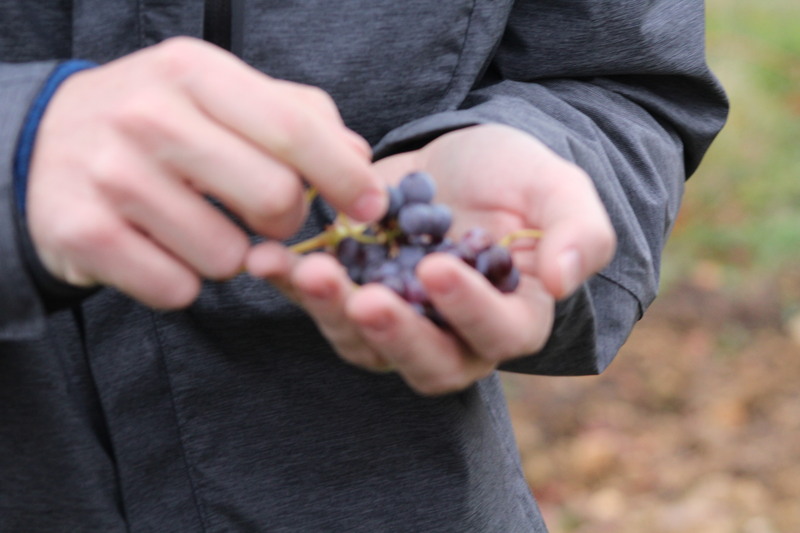 We got out of the car for a short rendezvous at a vineyard so we could taste, touch, and see a Grenache grape straight off the vine. 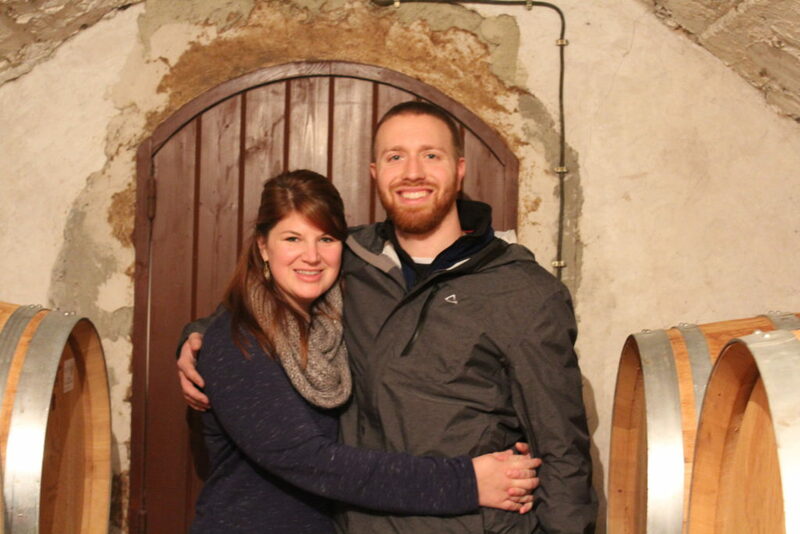 Then we headed off to our first winery! 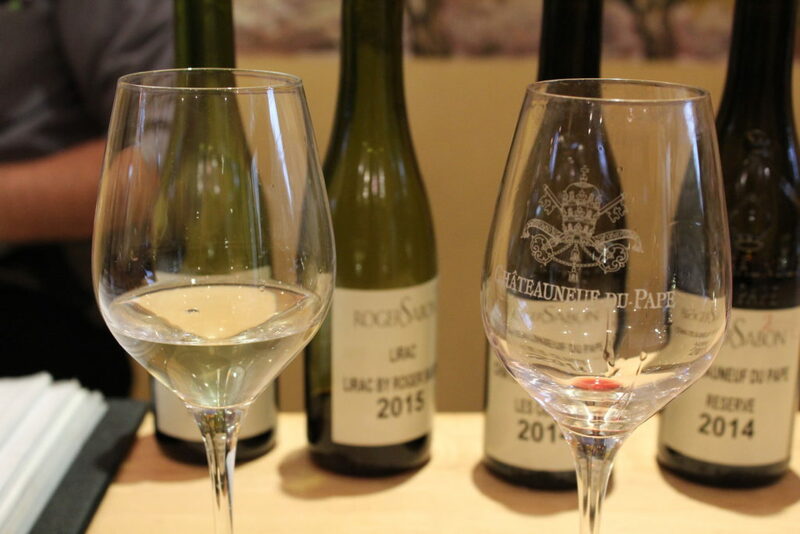 The Chateauneuf du Pape wine region was recognized for its quality when the papacy moved to Avignon in the 14th century and the popes began to drink the wine. The popes were the first ones to encourage exporting the wine from the area and not just drinking it locally. Since then, may regulations have been placed to protect the wine’s brand. The wine producers in CDP are such sticklers for quality that flying over the area has been banned since 1954. 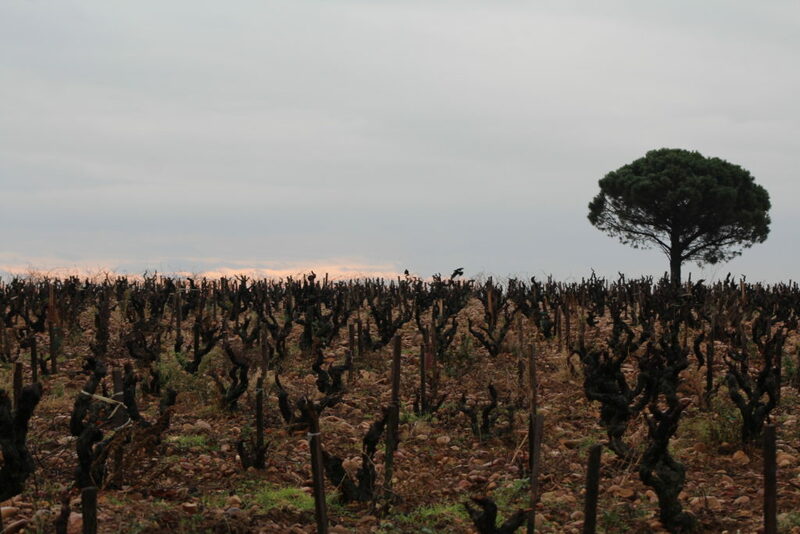 Buying plots of land in CDP is very expensive, partly because of the name recognition that comes with producing wines in the region, and also because most of the vineyards have stayed in the same families for generations. Rhone wines all produce wines with Grenache but unlike other regions, CDP wines must be predominately Grenache. 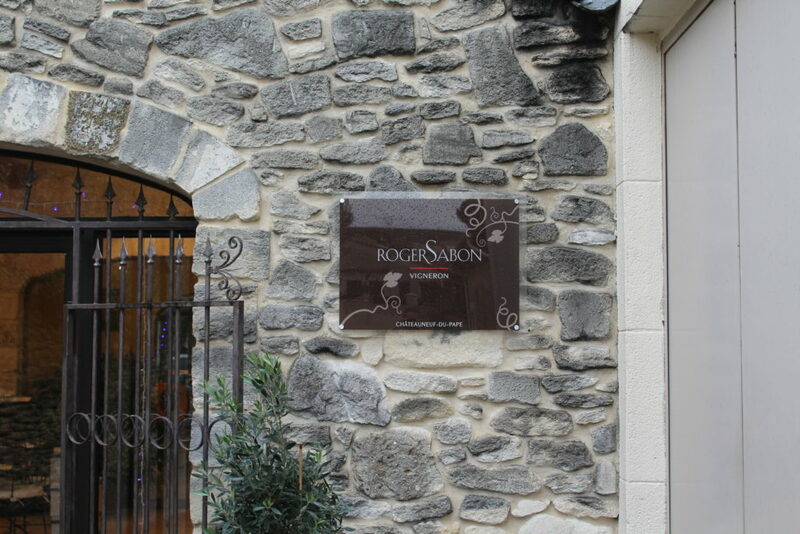 The first winery that Mike took us to in CDP was Roger Sabon. The Sabon family is one of the oldest wine producing families in Chateauneuf, and can trace their family back in this region to 1540. That’s a long time to make your family experts on wine. The winery as it’s known today produced their first vintage in 1921 – still a long time! 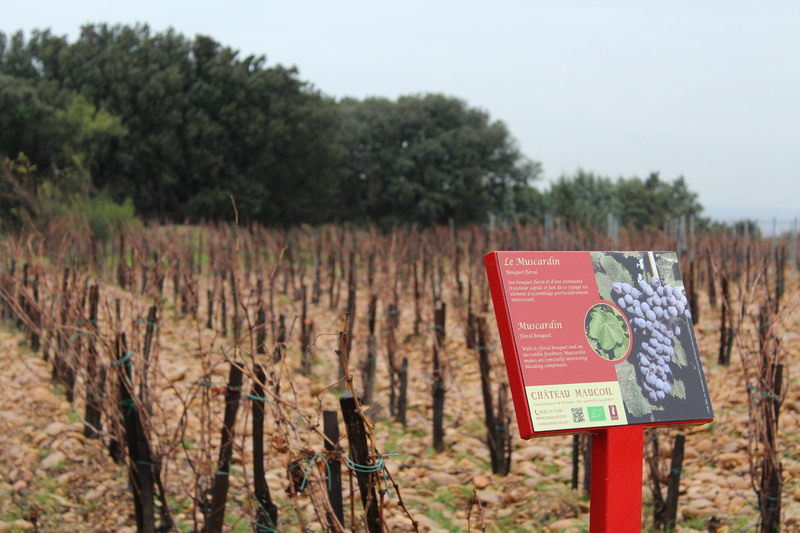 They largely produce red wines, but also put great care into their small production of their white CDP. 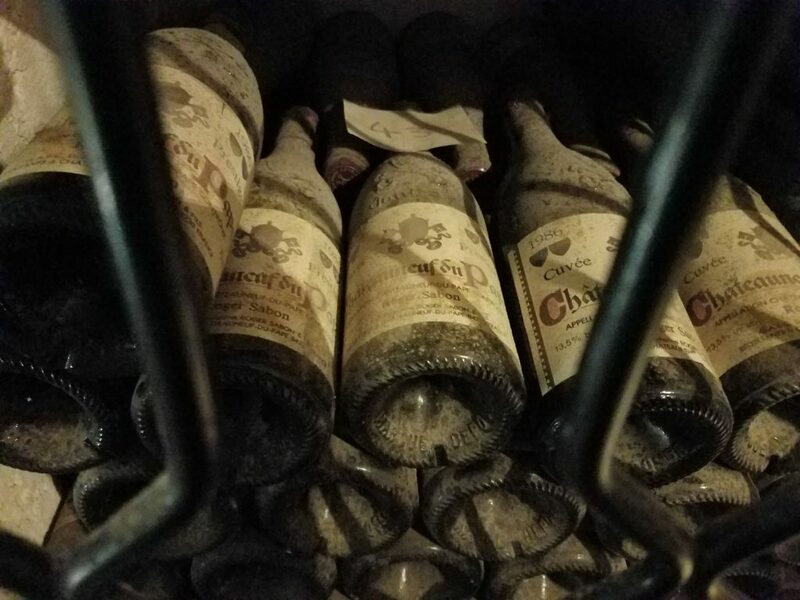 We entered the tasting room and were immediately impressed by the vintages you could buy right off the shelf – not to mention the crazy good prices. If only wine this good was this reasonably priced in the US! Just look at these gorgeous, dusty, carefully crafted 1986 Chateauneuf du Pape bottles. Makes me swoon. 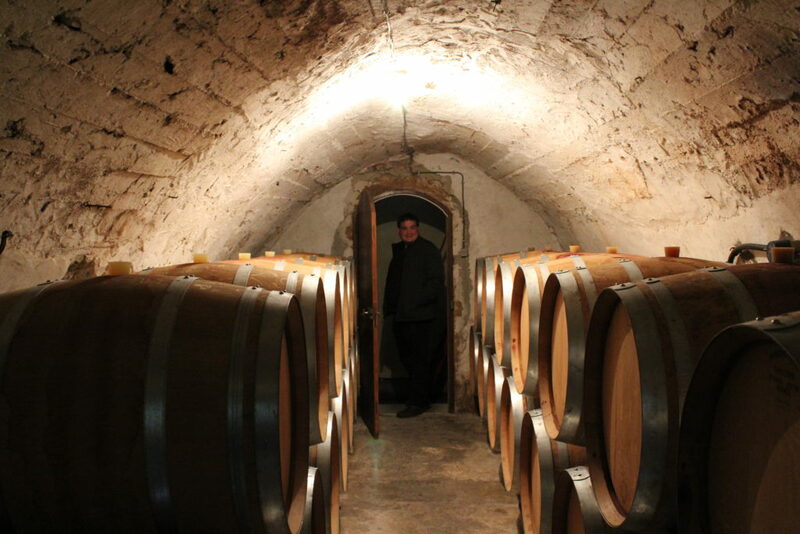 Before the tasting, Mike took us down to the cellar. There’s something particularly inspiring about being in the room where the wine is stored. You get to see with your own eyes where the magic is happening and imagining it nicely packaged into a bottle years later. 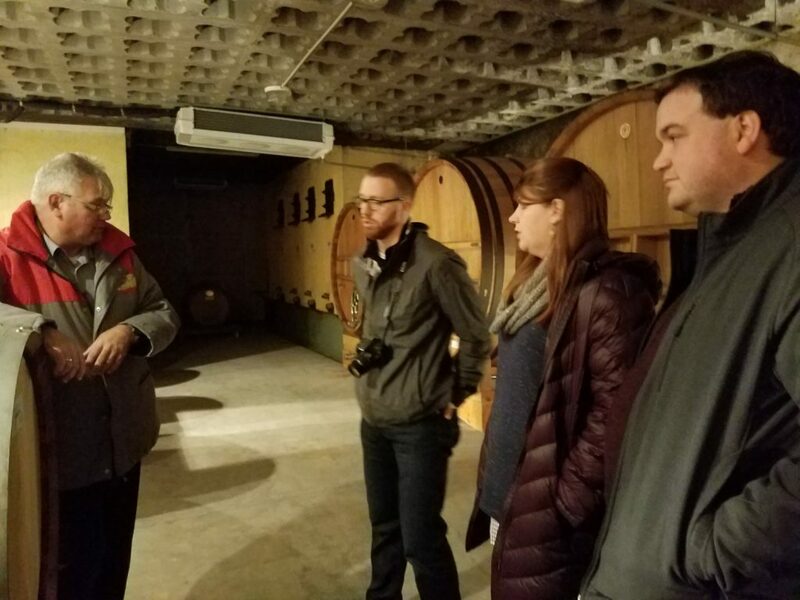 While in the cellar, Mike took us through the wine production, the wine barrels, and the aging process for Roger Sabon. 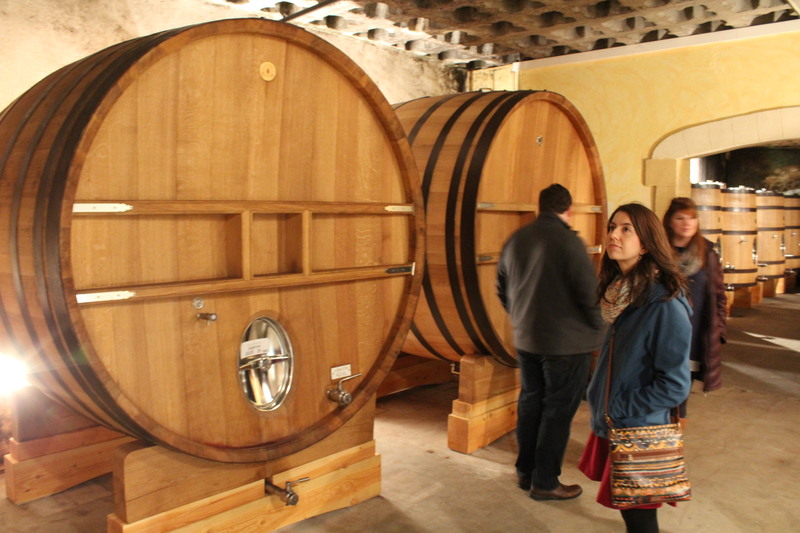 It was interesting to learn about the wine barrels and what the different labels on the barrels meant in order to signify the vintages and how the wine is made. Which grapes and the percentage used depends on the “level” of each of their reds: Olivets, Reserve, Prestige, and Le Secret des Sabon. Of course, all of their reds use Grenache. The Le Secret, the prize of Roger Sabon, is made up of 90% Grenache grapes that are grown on vines over 100 years old! After we left the cellar, the real fun began. Mike has great relationships with the surrounding wineries and did the whole tour and tasting himself. 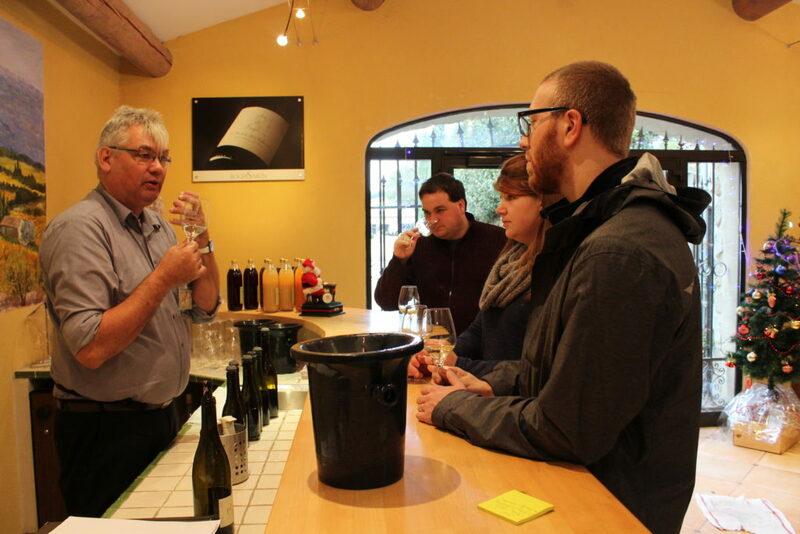 While it would have been nice to meet some of the genius behind the Roger Sabon winemaking, we didn’t feel like we missed out on anything as Mike looked right at home and did an excellent job at guiding us through their selection of wines. During the tasting we tried the white CDP as well as several vintages and levels of their red CDPs. We also tried their wines from Lirac and Cotes du Rhone appellations. We even got a little taste of their next vintage of the white CDP that was still waiting to be bottled. The red CDP’s were distinctive, tasting of leather, earthy herbs, and dark berries. You can see how silky and thick the wine was – look at those legs! My husband knows how to work a wine glass. We felt lucky being able to enjoy a tasting of such a prestigious, but non-pretentious, winery in the Chateauneuf du Pape. The Roger Sabon wines were an incredible value and a great way to introduce us the many bottles of Rhone wine that we would open up that week. 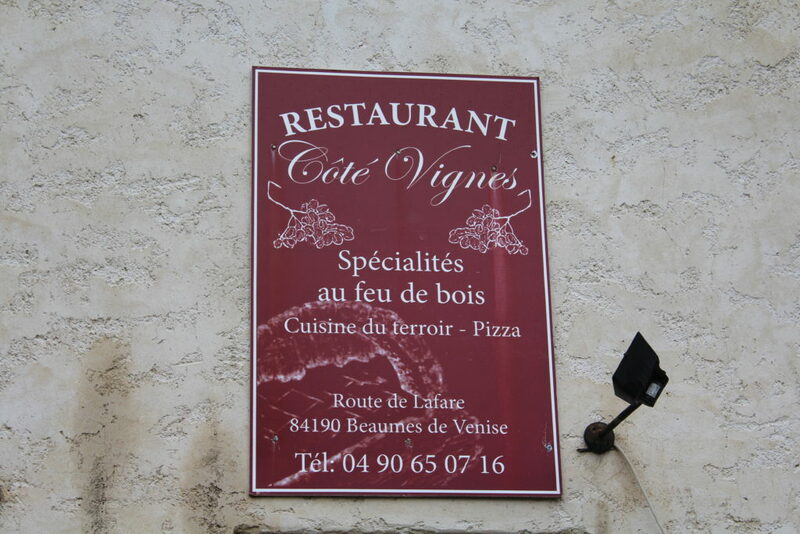 We had worked up an appetite after our first wine tasting, so Mike took us over to a restaurant in Beaumes-de-Venise, the Cote Vignes. It was a popular cafe in the area, and we saw an array of people in the restaurant, including a few business lunches. But mostly the people seemed to be speaking French, which is always a good sign! We would love to go back when their outside patio is open and you can sit eating your meal with the view of the vineyards. We stumbled our way through the menu, but almost all of us ended up ordering the daily special. 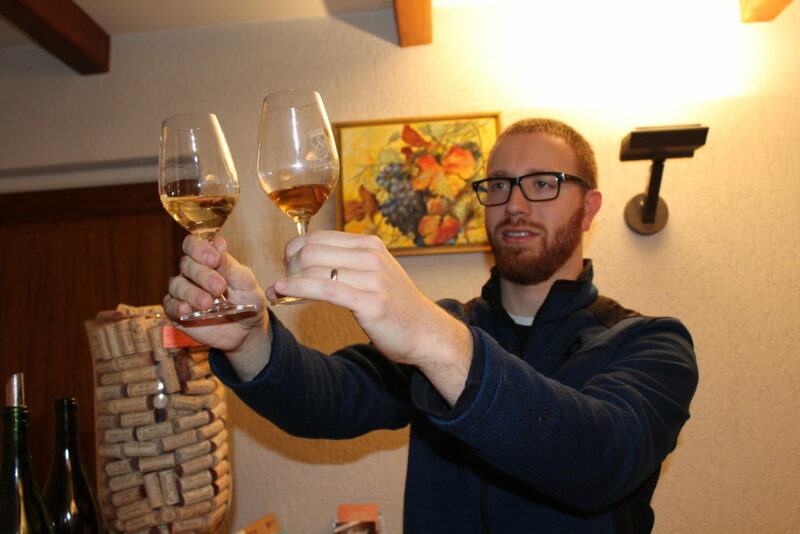 They started us off with a tasting of their Muscat, which was way too sweet for us but we were glad we gave it a try. 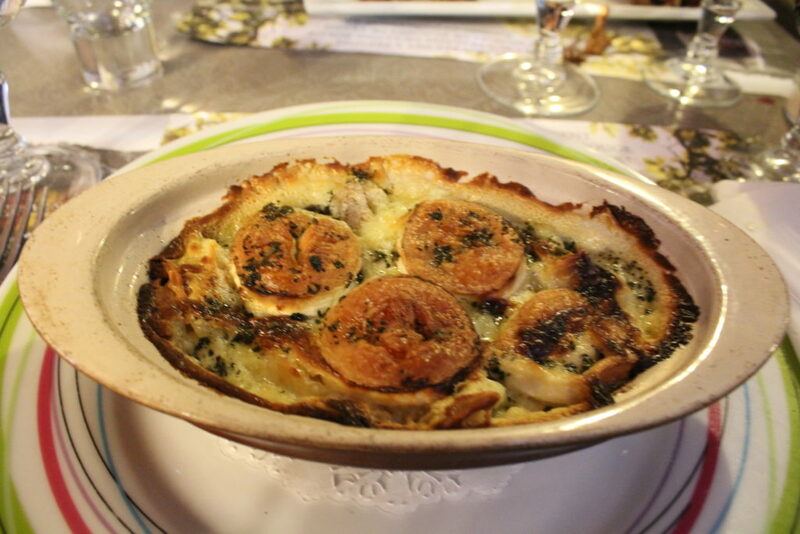 The salad was light and perfect and paired well with the main course, baked cheese ravioli that they cooked in their wood fire on the patio. One of us got a perfectly cooked sirloin that we all stole bites of to share. And of course we got a bottle of their house Cotes du Rhone. After lunch, we headed slightly northwest to Gigondas. Gigondas became it’s own appellation in 1971. 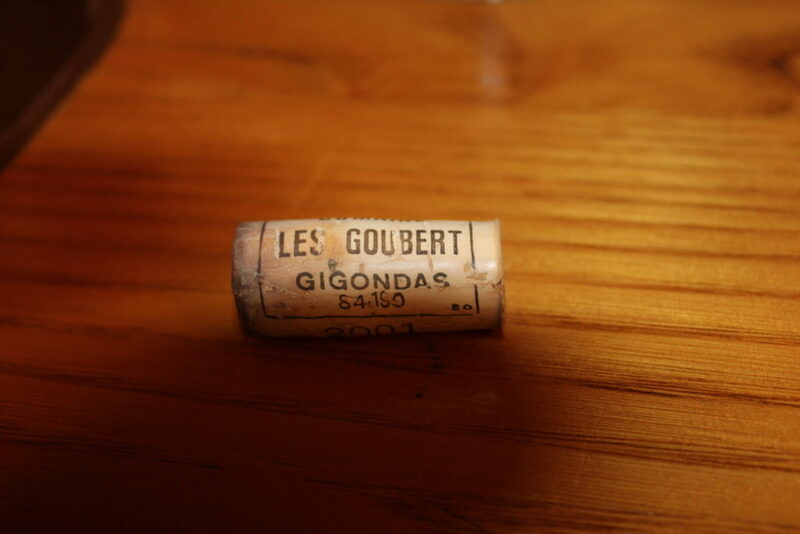 Gigondas derives from the Latin word “Jucunditas” which means joy and great pleasure. Many consider Gigondas as a stand-up rival to Chateauneuf, and possibly even better, but without quite the same price tag as a CDP. 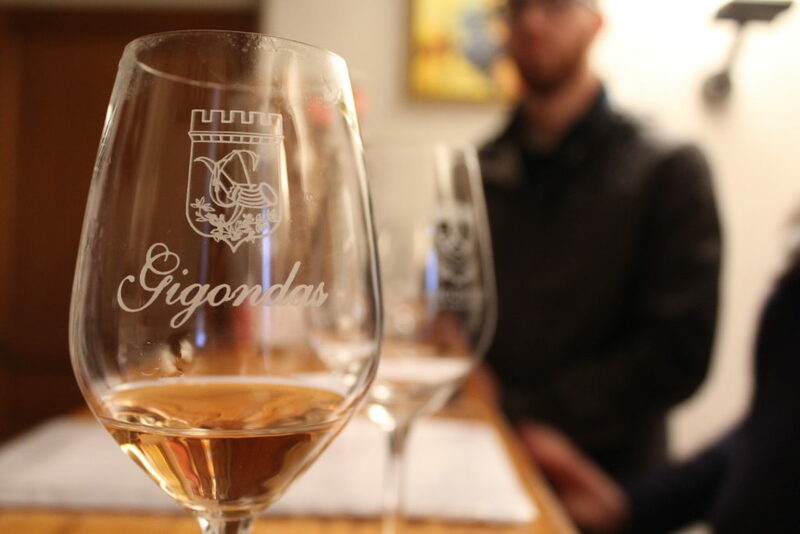 There are no white wines produced under the Gigondas label, and very little rosé, as they save their wow-factor wine for reds only. 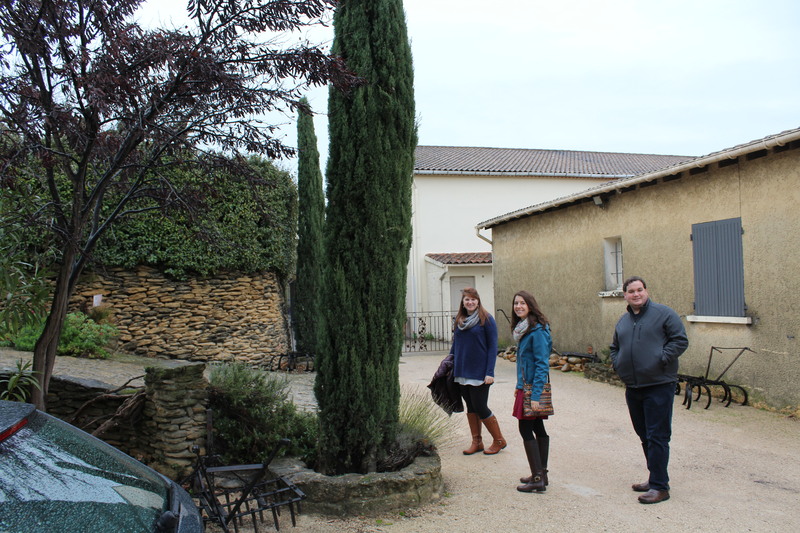 With that in mind, Mike took us to another family-run winery in Gigondas, the Domaine les Goubert. The winery has been kept in the family for many generations. 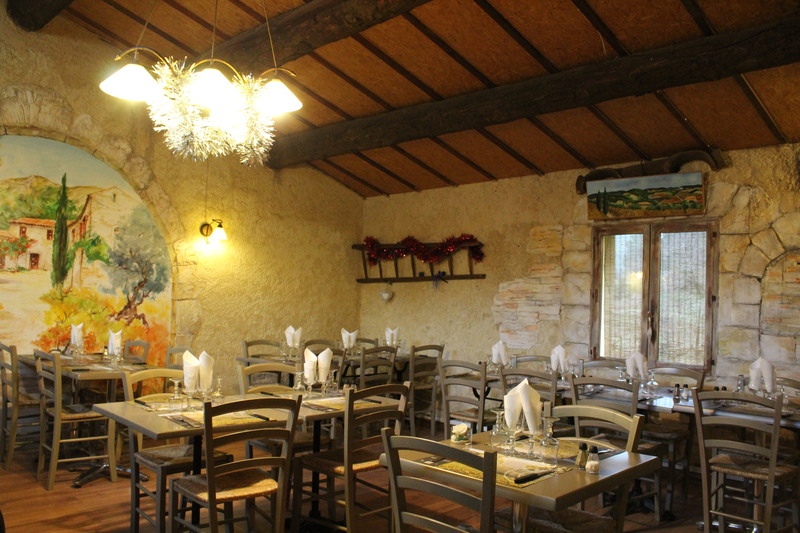 One of the buildings for the Domaine dates back to 1636, and was one of the first buildings built outside the medieval village. Mike took us through the winery and production facilities. The family’s dedication to producing legendary wine is evident. They don’t seem to have an intention of compromising on their quality or mass-producing their wines anytime soon. The owner wants you to appreciate the wine as much as he does. We were able to meet some of the family and even see their wine-bottling machine. 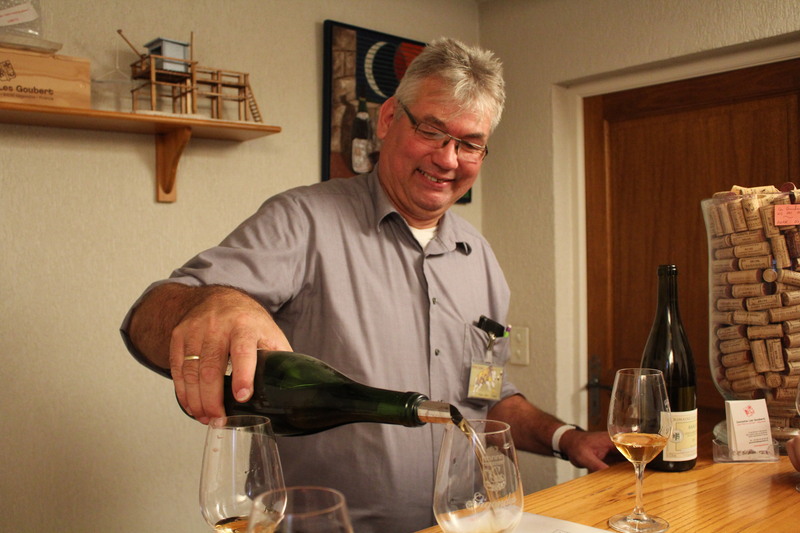 The owners, Jean-Pierre and Mireille, have a wine collection that is quite impressive, as they personally own hundreds and hundreds of bottles from all over the world. The multiple rooms that made up the cellar made a great photo shoot stop! This was a machine they used to use to filter out the wine! Can you imagine? 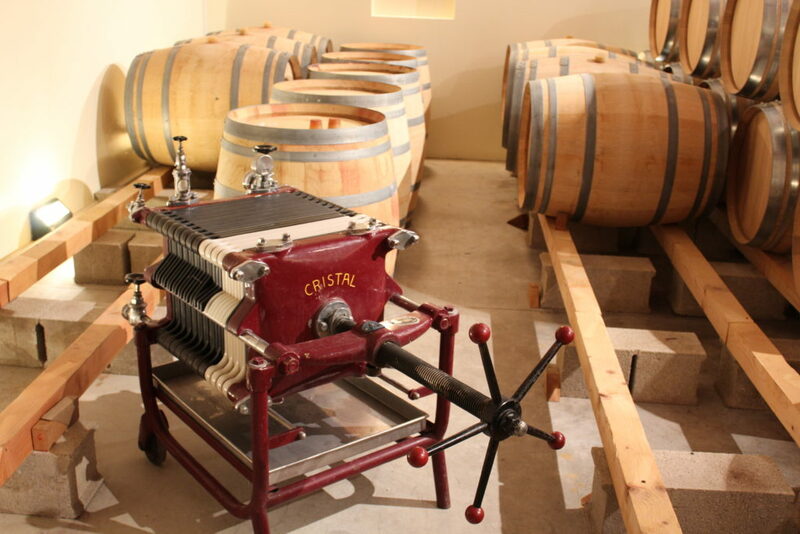 I bet winemakers appreciate the modern facilities and machinery that are available today. 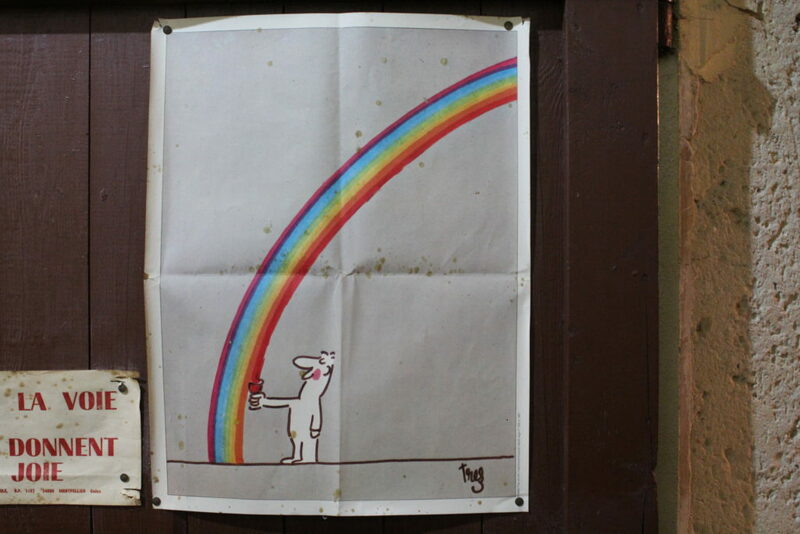 Clearly, wine has special significance at Domaine les Goubert. 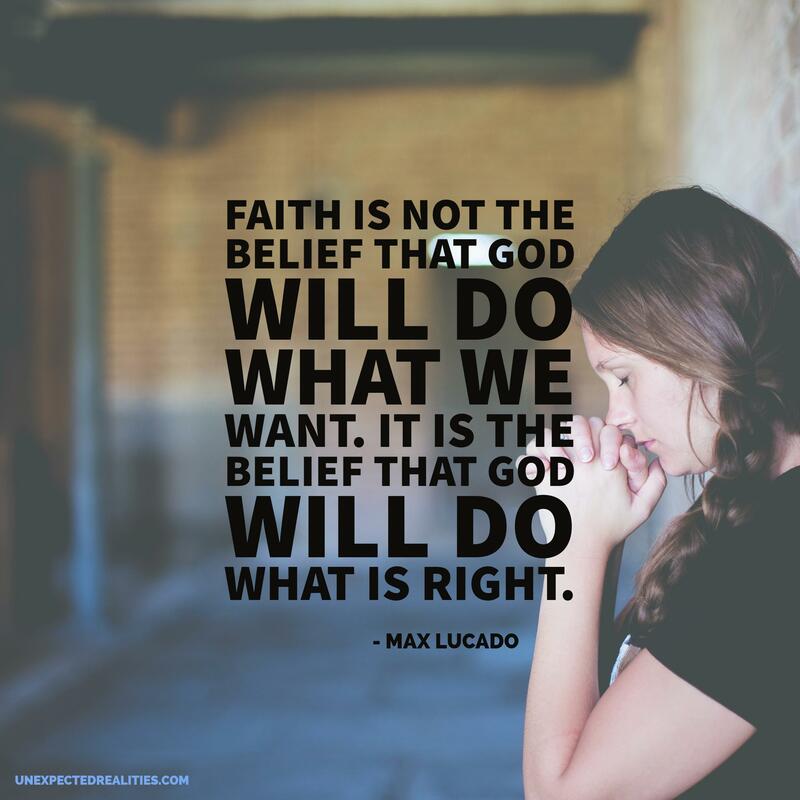 It’s as good as tasting a rainbow. 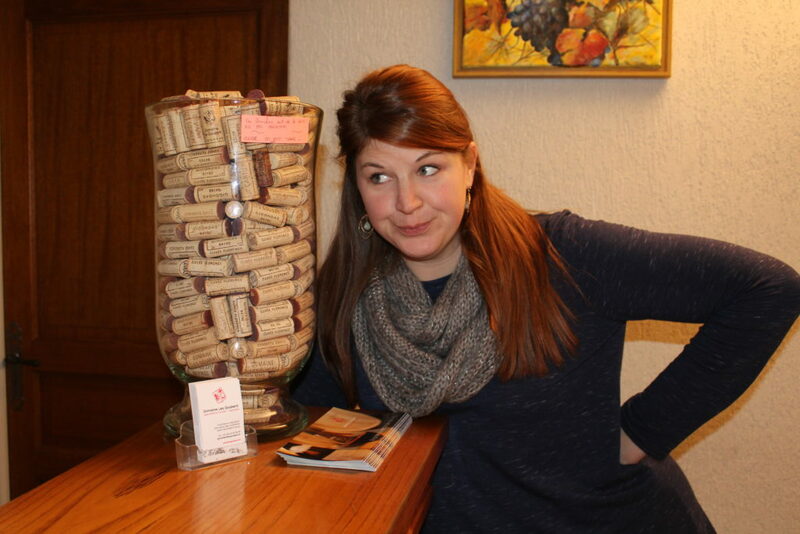 Pretty sure that Ashley was contemplating whether she could steal this collection of corks to use for a Pinterest DIY craft. As you can see, Mike showed off his wine-pouring skills and looked completely at home once again doing our second wine tasting at Goubert. We tried several different wines, including their rosé, which was spectacular (it is Provence, after all!) Their Gigondas and Gigondas Cuvee Florence were excellent examples of classic wines from Gigondas. They were very smooth and yet at the same time, you could distinguish the clay and limestone minerals from the terroir. And of course the Grenache held up and shined beautifully through both of them. Next up was Sablet White. 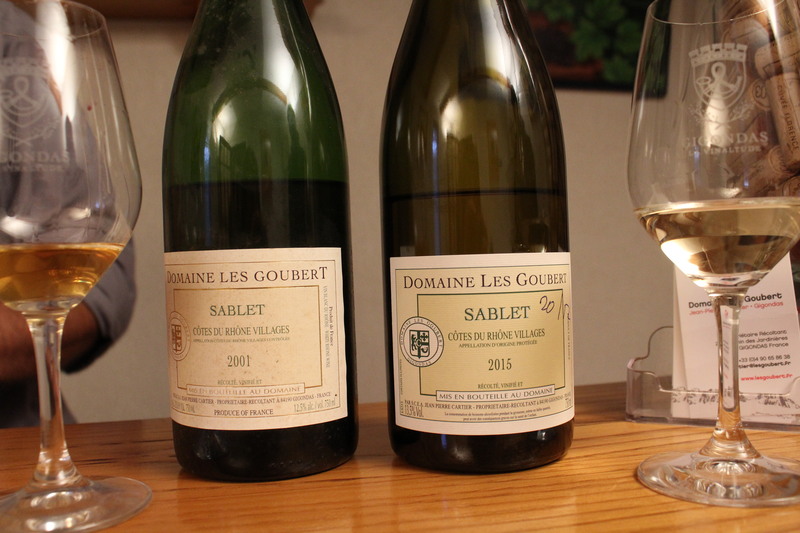 The Sablet is grown just north of Gigondas, and basically means “sand.” The most interesting part of the tasting was comparing the different vintages of their Sablet Whites. The idea of aging whites was still a relatively new idea to us. We have aged a German Riesling before, but for the most part when we think whites, we think that they need to drank right away. However, the Rhone Valley whites changed our mind about that. If you have the quality wine, then aging whites should be a no-brainer. To demonstrate this, Mike opened two vintages of their Sablet White, the 2001 and the 2015. The picture doesn’t quite do it justice, but look at the color differences between the 2001 and 2015. The 2015 was more what you would expect from a white, a pale yellow color that was fresh, drank easily, and freely swirled in your glass. 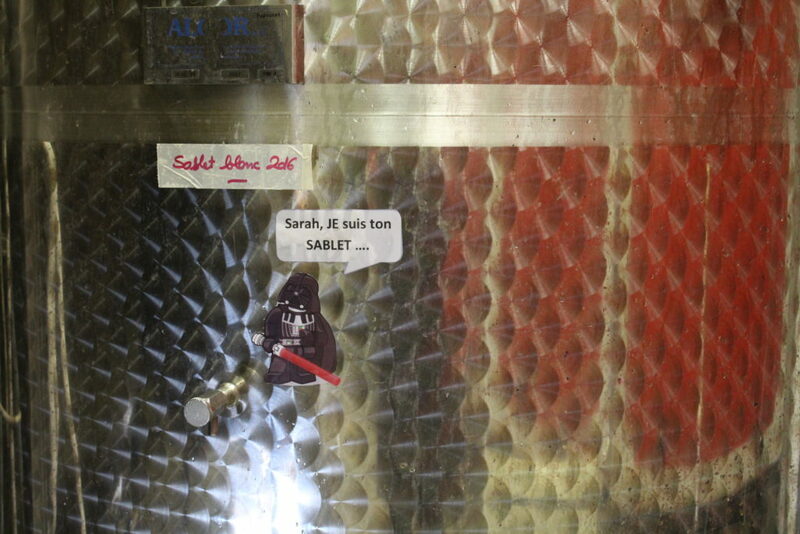 The 2001 Sablet that has been aging for over 14 years, however, had made an incredible transformation. The color had taken on a darker, honeycomb tint. 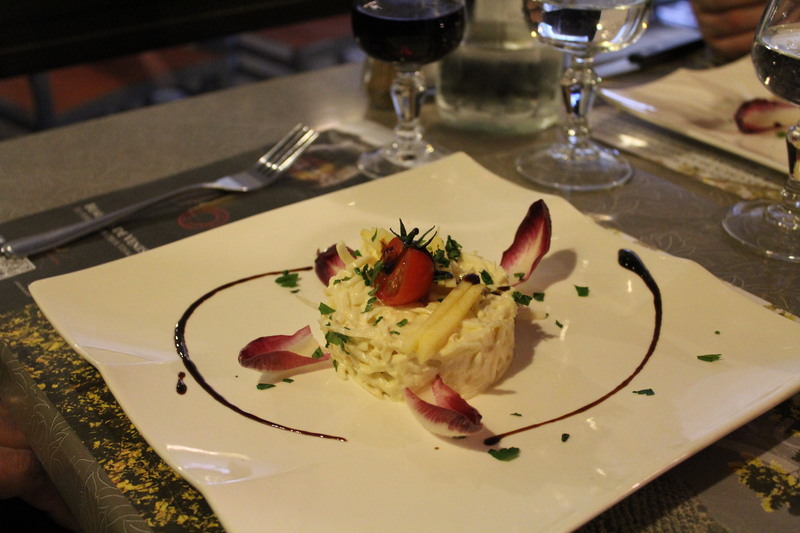 The texture and taste were completely different as well, it was thicker and reminded us of a port-style wine. Needless to say, we each bought two so we can try this white wine aging process on our own! 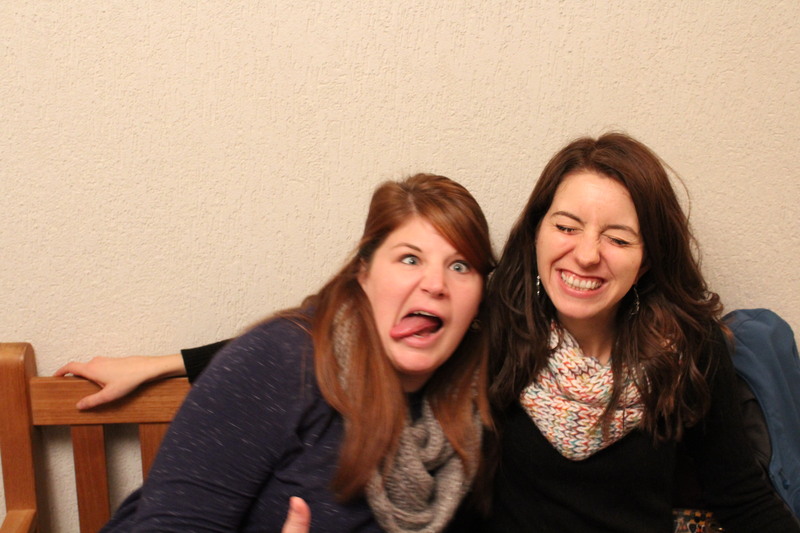 When on a wine tour, you cannot forget to take a goofy picture with your friend. And I suppose a good group photo could also be useful. We didn’t want the tour to end! 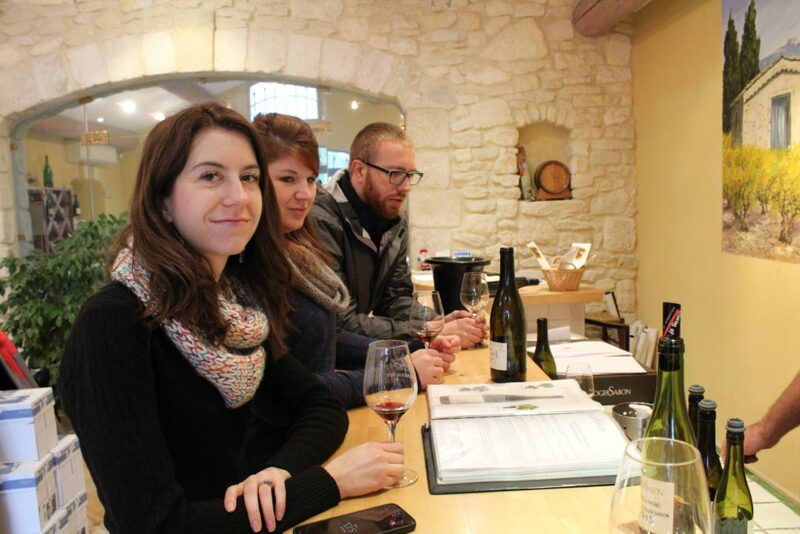 Doing a wine tasting tour in the Rhone Valley was a dream come true. While we have been wine tasting countless times, the wineries we went to and the wines we tasted were a unique experience and unlike anything you can have back here in the states. 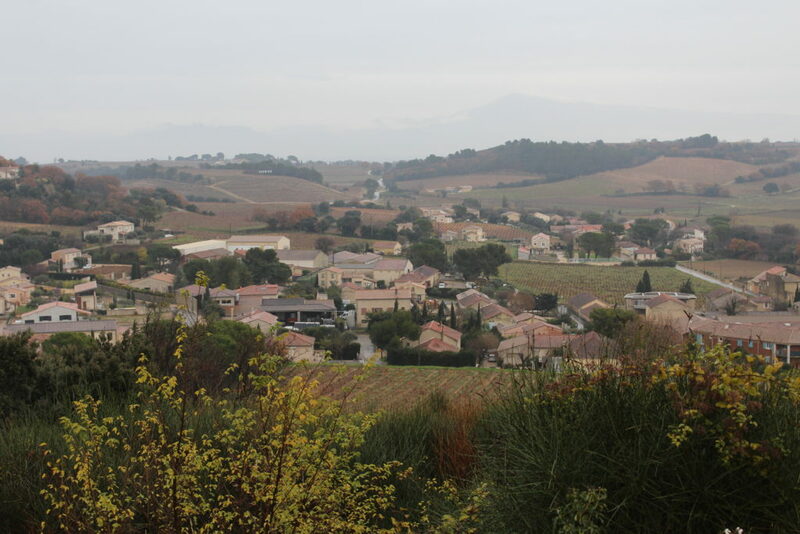 Overall, the Old World seems to have a better grasp on the dedication to quality and tradition that has made wine regions like the Rhone Valley famous. I’m glad we were able to experience wines from both Chateauneuf du Pape and Gigondas back to back in the same day, as it gave us an idea of how different wines can be even within such a small region. 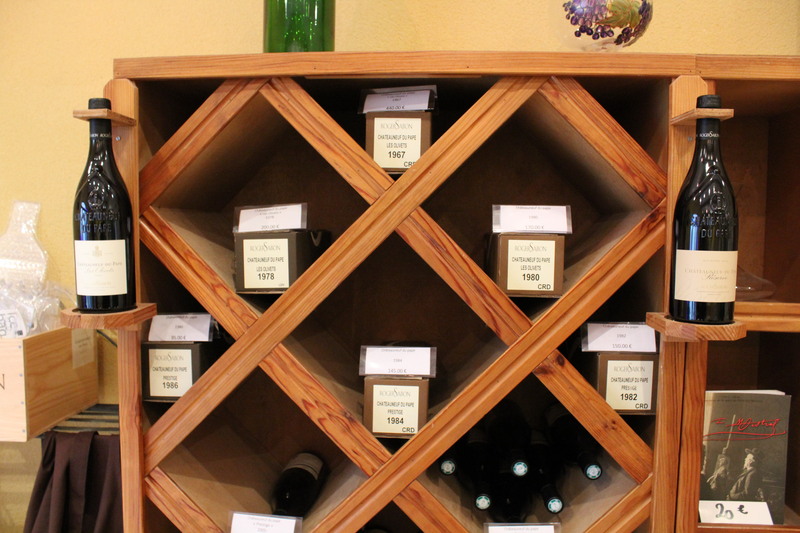 The bottles that we brought back from both wineries have become a prized possession. We can’t wait to open them and feel like we are back in the Rhone Valley! Mike was a good teacher, thoughtful to our requests, and professional. He was easy-going and had no problem laughing with (probably at us, sometimes!) as he attempted to share his vast knowledge about wine with us. We would highly recommend Mike if you ever find yourself in the Provence area. The only downside was the weather. 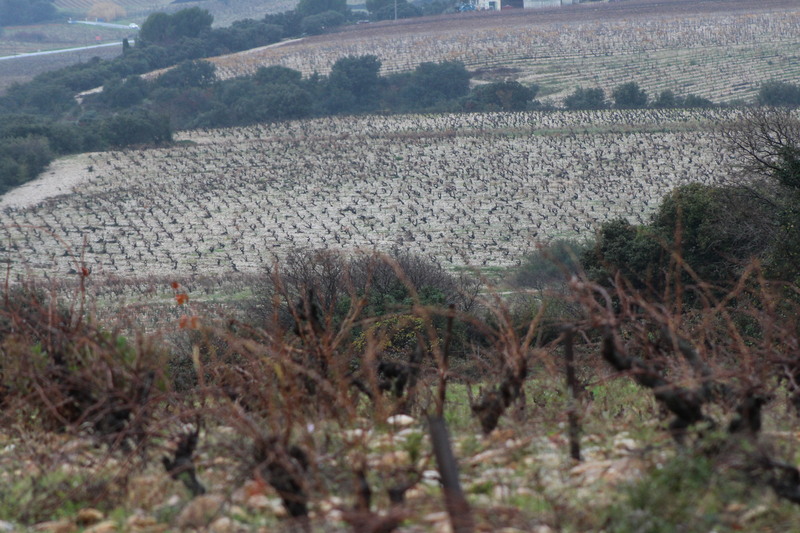 While we knew it would be colder in December, the rain put a damper on being able to explore some of the vineyards and get a better look at the varied types of soils. It made us long to come back during the warmer weather when the vines are in bloom! I hope this encourages you to buy the next flight deal you find to France and book a wine tour for the Rhone Valley.